During the early moments of the first EVA of the lunar mission Astronaut Shepard stands next to U.S. flag. 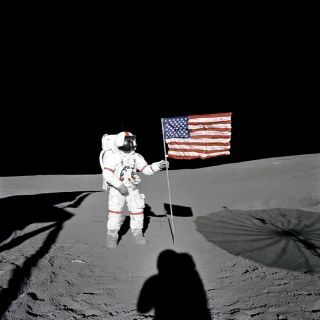 In this historical photo from the U.S. space agency, Astronaut Alan B. Shepard Jr., Apollo 14 Commander, stands by the U.S. flag on the lunar Fra Mauro Highlands during the early moments of the first extravehicular activity (EVA-1) of the mission on Feb. 5, 1971. Shadows of the Lunar Module "Antares", astronaut Edgar D. Mitchell, Lunar Module pilot, and the erectable S-band Antenna surround the scene of the third American flag planting to be performed on the lunar surface.